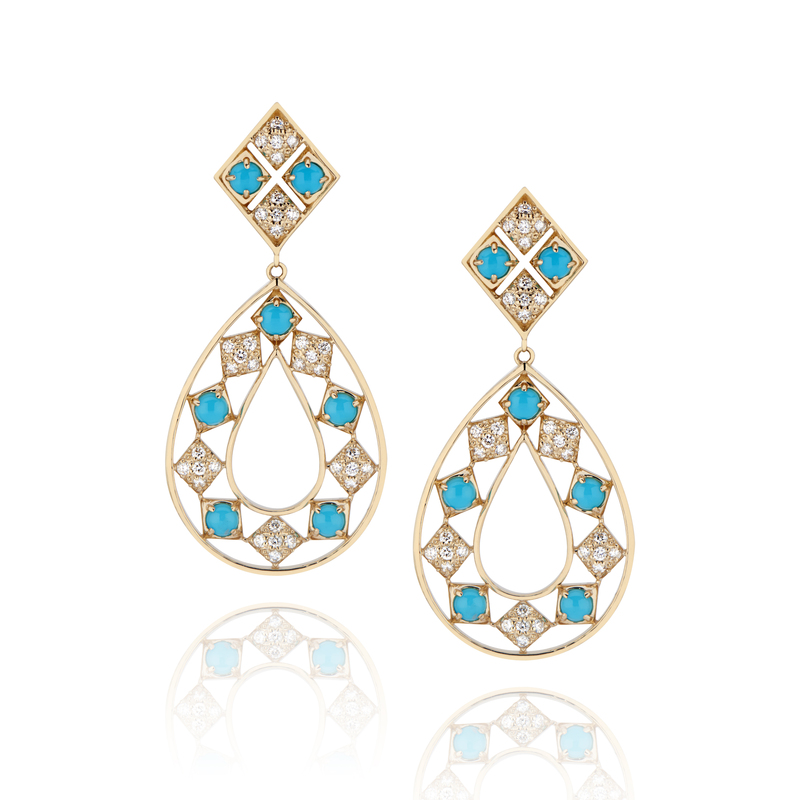 Summer is the perfect time to wear this stunning shade of blue, and we've got the perfect selection of turquoise pieces adorned in diamonds and accented by 14 karat yellow gold. Start your tropical journey with our newest Lucia additions, including our dainty Lucia Bar Necklace. 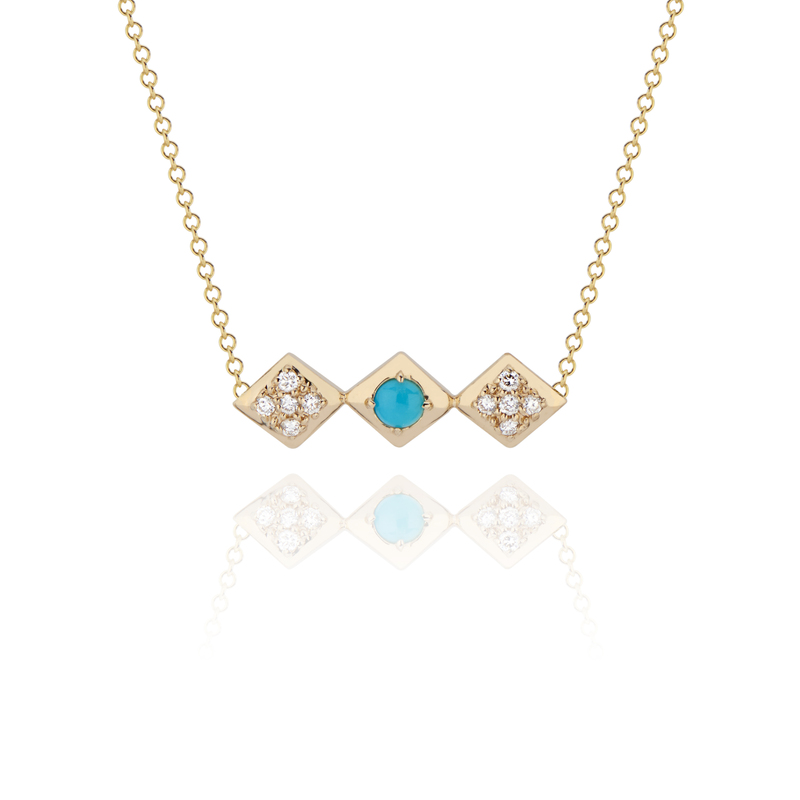 While it's perfectly pretty on its own, we certainly wouldn't say no to pairing it with the statement-making shapes of our Lucia Turquoise and Diamond Statement Necklace and Lucia Turquoise and Diamond Drop Earrings! Pair with a white cotton or linen bardot blouse, a sarong skirt or scalloped shorts, and an open toe sandal for an effortlessly chic summer look! Don't think we've run out of your favorite color yet! For those who want a matching ring, we've crafted our stunning Regalo Turquoise Ring, with a crown-like shape and diamonds fit for a queen! For a truly royal feel, match it with our Regalo Turquoise Statement Necklace. Dress it up or dress it down with our Regalo Turquoise Two in One Earring, with a stunning jacket you can take off for a simpler, everyday look. Perfectly practical and ideal for daytime or nighttime wear. Nothing says summer romance like these pieces combined with a lace kimono and linen dress in white, or — if you're daring to be delicately bold — a soft orange. Not into turquoise? Don't go without a summer must-have! Our Regalo Diamond Pendant, featuring the iconic diamond shape design you know and love, is perfectly sized to sparkle all its own or be paired with other necklaces ( take for instance our itty-bitty Mini Gianna Pendant, or our ever-so-slightly larger Gianna Pendant with Sapphire in your choice of blue, pink, or green! Not only do they sparkle in the sun, but they're perfect for wearing well into the fall and winter months! Not that we intend to cease production of some glittering goodies for when it cools down.